The remarkable electromagnetic properties of the Great Pyramid of Giza could soon inspire nanoparticle designs for highly-efficient sensors and solar cells. Scientists have discovered the famous pyramid concentrates electric and magnetic energy into its internal chambers and below its base, creating pockets of higher energy. If this concentrating effect is able to be recreated on a nanoscale size, it could lead to a wave of new, more efficient sensors and solar cells, the researchers claim. While the 481-foot pyramid built thousands of years ago for Pharaoh Khufu has long drawn intrigue for its purported mythical qualities, the study is among a growing body of research attempting to finally get to the bottom of its physical properties. ‘Egyptian pyramids have always attracted great attention,’ says Dr Andrey Evlyukhin, scientific supervisor and coordinator of the research. The international research team looked into the relationship between the shape of the Great Pyramid of Giza and its ability to focus electromagnetic energy. To do this, the team led by ITMO University in Saint Petersburg, Russia, created a model of the pyramid, one of the seven wonders of the ancient world, to accurately measure it electromagnetic response. The researchers used the model to see how wave energy is scattered or absorbed by the pyramid. They tested the interactions with waves of resonant length, ranging from 200 to 600 metres (656ft to 1,968ft). Given the lack of reliable information about the pyramid’s properties, however, the team says they had to fill in the blanks for some factors. ‘We had to use some assumptions,’ Evlyukhin admitted. ‘For example, we assumed that there are no unknown cavities inside, and the building material with the properties of an ordinary limestone is evenly distributed in and out of the pyramid. Scientists used multipole analysis – a method widely-used in physics to study the interaction between a complex object and electromagnetic field – to reveal how the pyramid concentrates electromagnetic energy into in its underground chambers. This includes the two chambers believed to have contained the remains of Pharaoh Khufu and his wife, as well as the third unfinished chamber buried beneath the base. The Ancient Egyptians that built the pyramids more than 4,400 years ago were not aware of this quirk of design. However, researchers now believe the relationship between the design of the pyramid and its ability to focus wave energy through to its core could play a hugely-important for nanoparticle research in the future. When considering the pyramid on a substrate – such as the limestone plateau – the researchers say it focuses the energy through the empty spaces to the substrate. ‘In the case of the Pyramid on the substrate, at the shorter wavelengths, the electromagnetic energy accumulates in the chambers providing local spectral maxima for electric and magnetic fields,’ the researchers wrote in the study. For more than 4,500 years, Egypt’s pyramids have kept their secrets hidden deep within the labyrinth of passages and chambers that lie inside their towering stone structures. But the long-running row over whether the Great Pyramid of Giza is hiding a network of previously undiscovered tunnels behind its stone walls has now been answered. 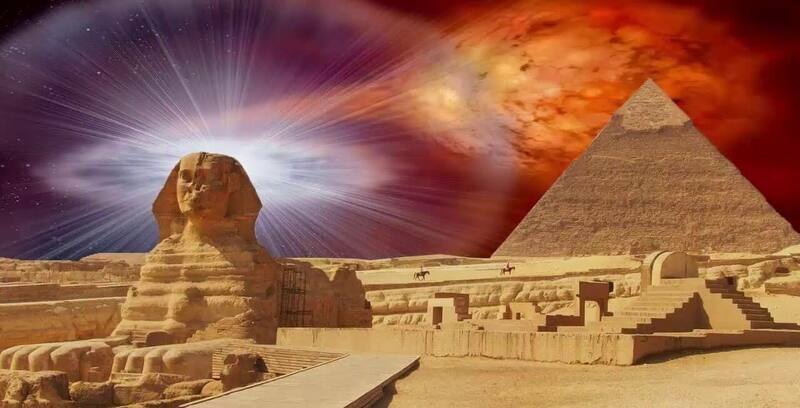 The researchers confirmed the find using cosmic particles known as muons to scan the Great Pyramid of Giza. They used the scans to create maps to reveal the internal structure of the 479 feet (146m) high pyramid. Last year thermal scanning identified a major anomaly in the Great Pyramid, the largest and oldest of the pyramids at Giza and one of the seven Wonders of the Ancient World. Those scans identified three adjacent stones at its base which registered higher temperatures than others. This led to theories that they may be hiding a secret chamber that had yet to be discovered. A team of experts then set up the ScanPyramid’s project to use muons, tiny subatomic particle that are typically produced by cosmic rays smash into atoms on Earth, to peer through the pyramid’s huge stone blocks, some of which weight up to 15 tons. Dr Hawass has in the past been sceptical of the usefulness of conducting such scans. He recently clashed publicly with British Egyptologists over their theory that a secret burial chamber may be hidden behind the walls of Tutankhamun’s tomb in his pyramid in the Valley of the Kings. ‘Although this research seems unconventional, modern physical approaches have been previously used to study the Great Pyramid, and led to a discovery of a completely new structure,’ said Antonija Grubisic-Cabo, a physicist from Monash University who was not involved in the research. However, the researchers behind the study are confident that the manner in which electromagnetic energy distribute in the pyramid could help scientists create efficient nanoparticle designs in the future. That depends on whether the researchers are able to recreate the concentrating effect observed in the Great Pyramid of Giza on a nanoscale size.